Benchmark's IR remote control unit is constructed from die-cast aluminium and is compatible with the DAC1 HDR, DAC2 and DAC3 converters as well as HPA4 and LA4. The unit is designed for comfort, ease of use and durability. 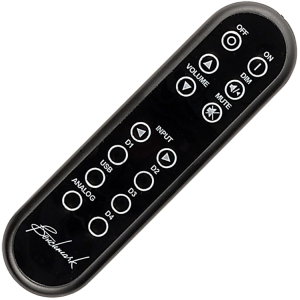 The remote has a 'DIM' button which reduces the output volume by 20 decibles on most Benchmark products and enables switching between typical listening and background volume levels without altering the volume settings. This is also ideal for HDTV as it supports toggling to lowered volumes during commercials. Separate buttons for 'ON' and 'OFF enables unambiguous set up of remote universal systems. Dedicated input select buttons enable direct access to input sources. This unit is compatible with early DAC1 HDR converters that shipped with a plastic remote, but the dedicated input select buttons will not work with these early units. These early DAC1 HDR converters can be factory upgraded to add this feature.